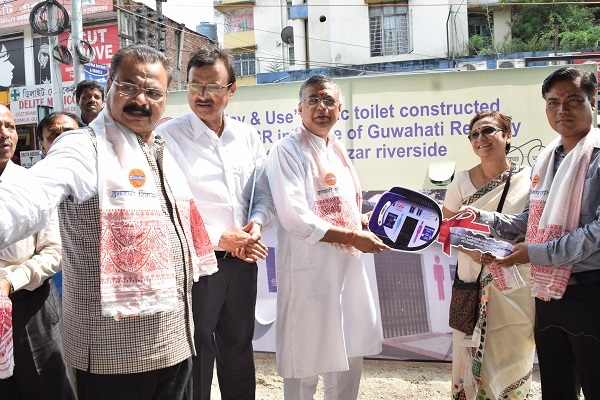 Assam Industries and Commerce Minister, Chandra Mohan Patowary and Education Minister, Siddhartha Bhattacharya graced the function of the opening of four toilet blocks constructed by Guwahati Refinery as part of its Corporate Social Responsibility (CSR). The programme was held at the Six Mile project site below the Six Mile flyover on Friday. 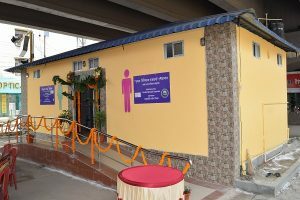 Guwahati Refinery, has in the first phase during 2017-18, completed the construction of four such ‘Pay & Use’ sanitary toilet blocks at Sixmile flyover, Ganeshguri flyover, Fancy Bazar riverside and Jalukbari flyover locations. In total, ten prominent locations within Guwahati city, with high public footfalls, were selected by Guwahati Municipal Corporation (GMC) authorities on litigation-free public land, owned and made available by GMC for undertaking the construction. Speaking on the occasion, Minister Patowary hailed the CSR initiatives of Guwahati Refinery, particularly its work in the area of sanitation, drinking water and skill development. He called upon all the refineries of Assam to expand their CSR activities beyond the area of operation to benefit the people across the State. Education Minister Siddhartha Bhattacharya thanked the Guwahati Refinery authorities for construction of the public convenience facilities and hoped that they will continue its social activities for the greater cause of the public. The layout of these ‘Pay & Use’ sanitary toilet blocks are in an Assam-type structure with separate facilities for men and women, along with an access ramp for Person with Disabilities (PwD)s.
‘This is part of Guwahati Refinery’s effort as a committed stakeholder towards realization of the Swachh Bharat Mission’, stated the refinery’s Executive Director, Jogen Barpujari at the meeting. Guwahati Refinery has handed the toilet blocks to GMC authorities for their subsequent operation and maintenance through selected engaged specialized agencies under the overall supervision of GMC authorities. Mayor Mrigen Sarania, Monalisa Goswami, Commissioner, GMC and other senior officials were also present in on the occasion.